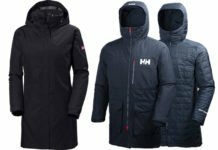 The men’s Sandstone Shield Hooded Jacket features a lightweight hybrid softshell great for the active outdoorsman. 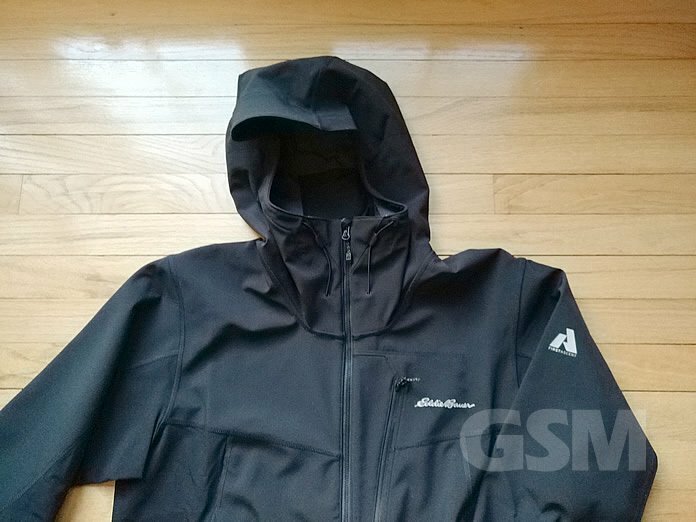 This lightweight shell offers water-resistance and breathability in a great looking shell that’ll work nicely for the streets as well as outdoor activity. 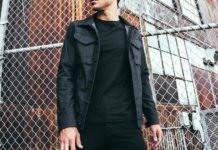 This Sandstone Shield Jacket is constructed of 8.4-oz Flexion 4-way stretch waterproof material, breathable polyester and spandex at the shoulders, front body and upper sleeves. 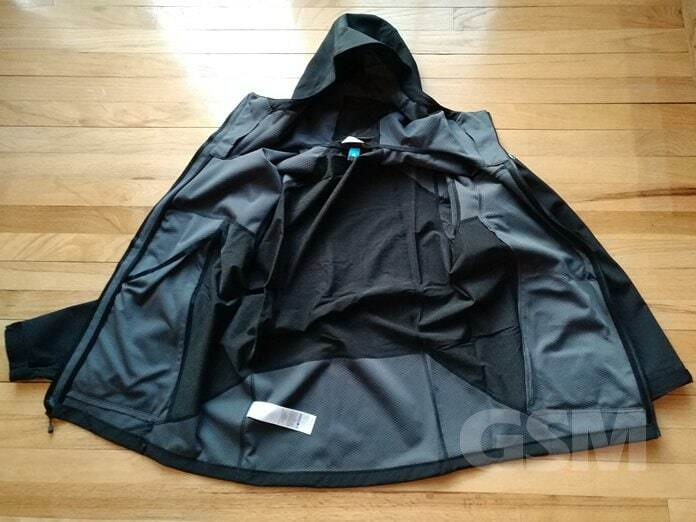 The torso is made of Sandstone nylon/spandex/polyester at the sides, upper back and underside of the sleeves. 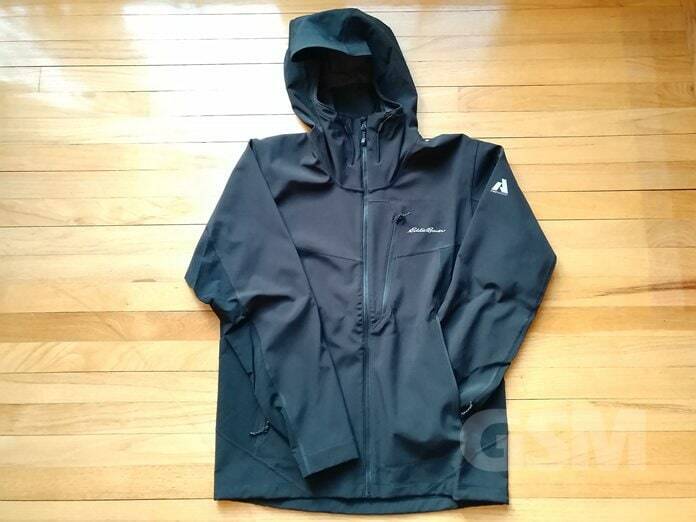 The jacket is treated with Stormrepel DWR finish to help shed moisture from soaking in. 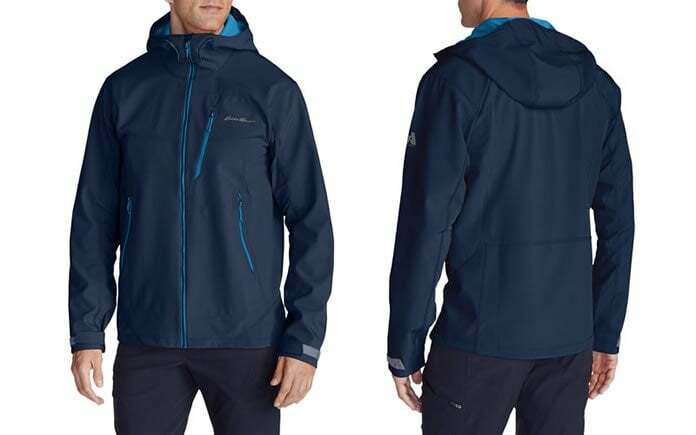 The Eddie Bauer first ascent jacket is optimized for comfort and maneuverability. You’re able to maintain agility and flexibility and is an active fit designed to be worn over a mid or base layer. If you like to layer up a bit more and prefer a more relaxed fit, size up for more casual wear. 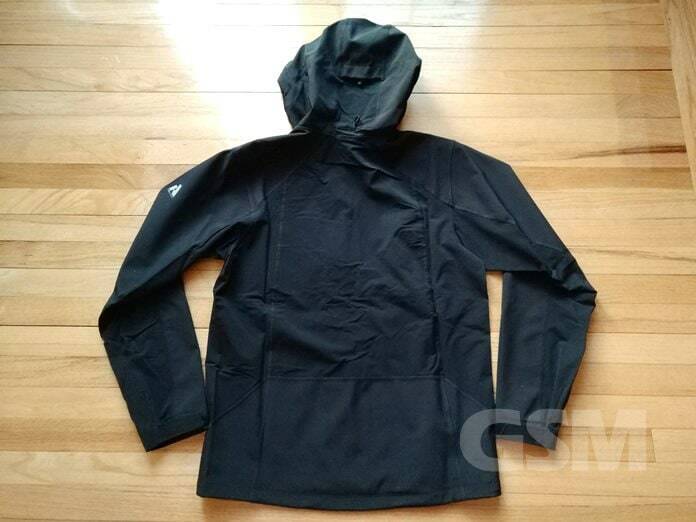 The fit is categorized as active but still loose enough to put on a base or light midlayer. What’s nice is that the design looks cool and is loose enough to remain agile and still look masculine. Two zippered hand pockets and a well-used go to chest pocket with essential zipper pulls secure the contents so you can feel confident during your activities. A fully adjustable hoodie looks great and is helmet compatible. Extremely comfortable to wear and functional. The nice droptail design offers some extra coverage while your bending over or reaching up. 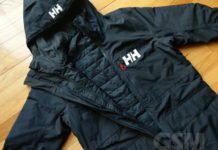 The sizing runs true to size and for an active fit, we are not feeling a bit constricted. The jacket is designed well, we loved the hybrid construction which seemed to be quite appropriate for performance sake but also looks nice in the two-tone in black. The subtle two-tone shade accentuates the cuts while outlining the different materials. The sleeve length is slightly elongated for good coverage with adjustable cuffs for a tidy fit. The waistline also features an adjustable drawcord to keep out those nasty drafts. 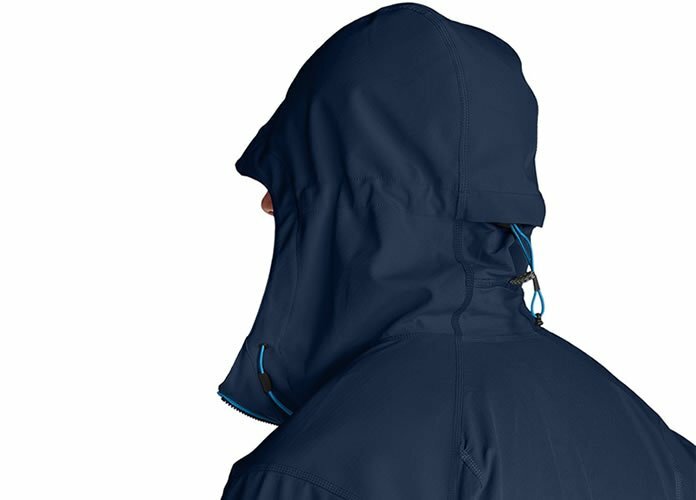 This is not rain gear and the lack of seam seals and non-waterproof zippers will tell you that. If not you’ll notice it if you try and stand in a downpour pretty quickly. That said, the DWR finish will repel and bead water for a short period enough for you to toss on some rain gear. Also works great for light drizzle where you still have camp to set up. 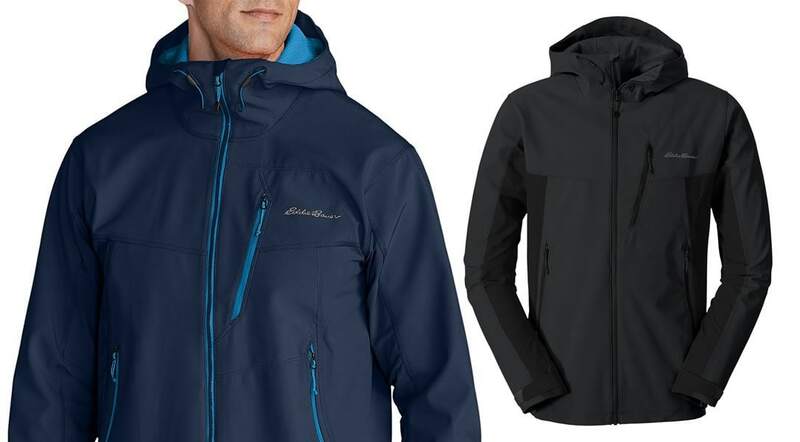 The Sandstone Shield Hooded Jacket from Eddie Bauer features a great looking cut with hybrid construction for a lightweight, performance outerwear layer for the active guy. It’s extremely comfortable and also looks great on the streets for casualwear. Available in Reg/Tall in Black, Med Indigo, Russet.